Inspired by the breath-taking view of mountain, Saenkom Chansrinual created this new collection of artwork titled “Grand Mountain” to pay tribute to the greatness of nature and the heavenly view from the top of the mountain. Since young, he has been a nature lover and always loves to travel to places where he can only find himself surrounded by trees and mountains. “Grand Mountain” is an art of nature that captivates and melts the hearts of many. The media used in this series of artwork is remarkable. He used a self-formulated technique in which the solid acrylic were first melted, squeezed, planted in an overlay manner, one-by-one painstakingly onto the canvas to form magnificent mountain scenery which transports the viewers into a sense of peacefulness. Apart from the rich texture he created, his ultimate skill in applying the metallic paints to create the three-dimensional perspective effects in his artwork is equally astonishing. 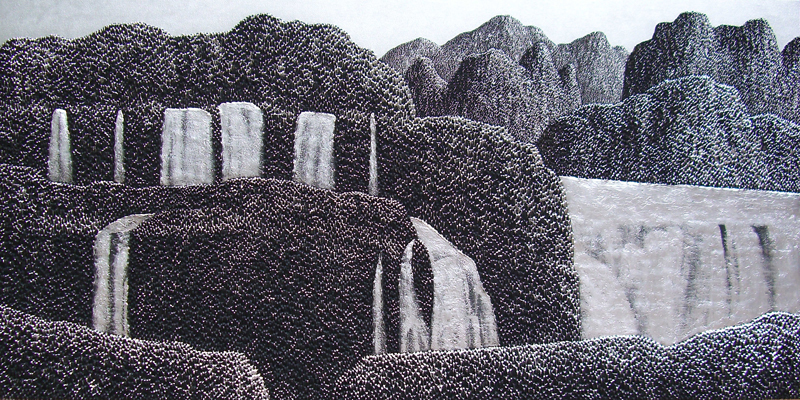 Lately, he has incorporated waterfalls and trees into this exclusive range of artwork. He has participated in many exhibitions in Thailand and recently in Asia, and he has won several prestigious art awards over the years, distinctively the ASEAN art award in year 2000.